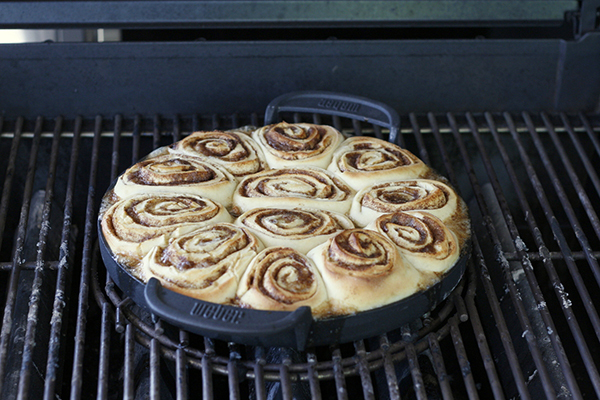 Yes, you can bake cinnamon rolls on the grill!!! This recipe is inspired by our interactive dining series for brunch in the Weber Grill Academy. We wanted to have a great, warm toasty cinnamon smell as people walked in to the Academy. This recipe is from Jaime Purviance, and first appeared on the Weber Blog on Dec 18, 2015. When making these, make sure to give the dough enough time to rise before baking, or it will be dense. Also, use the freshest ground cinnamon as you can. The flavors are very simple and straightforward, so every ingredient needs to shine! Happy baking on the Grill! 1. In the bowl of a stand mixer whisk ½ cup of the milk, 1 tablespoon of the sugar, and the yeast and let stand until frothy, about 5 minutes. 2. Using the paddle attachment with the mixer on low speed, add the remaining ¾ cup milk, the remaining ¼ cup sugar, the salt, and eggs and beat for 1 minute. 3. Change to the dough hook and add 5½ cups of the flour. Starting on low speed and working slowly up to medium, mix until the dough is fairly smooth, about 3 minutes. 4. Reduce the speed to medium-low and add ½ cup butter and the remaining ½ cup flour. Transfer the dough to a floured work surface and knead until the dough is soft, smooth, and no longer sticky, about 2 minutes. 5. Transfer the dough to an oiled bowl, cover, and let rise in a warm place until doubled in bulk, about 1½ hours. 6. Combine the brown sugar and cinnamon. 7. Press the dough down, and then turn out onto a lightly floured surface. 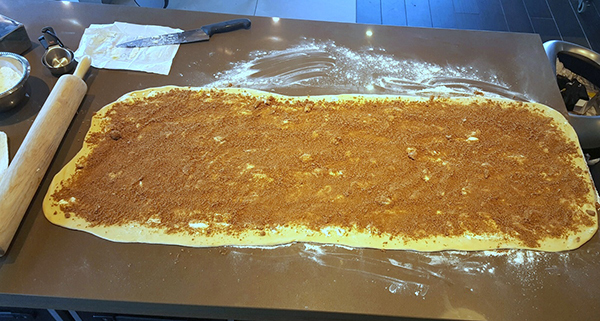 Knead the dough two to three times, and then roll out into a 24-inch long by 12-inch wide rectangle. Spread the dough all over (do not leave a border) with ¼ cup plus 2 tablespoons of the butter. 8. Sprinkle evenly with the cinnamon sugar. Starting at the long side closest to you, tightly roll up the dough, and then pinch the seam closed. 9. Cut the log of dough into 12 two-inch pieces. Generously grease the bottom and sides of a 10-inch cast-iron skillet with the remaining butter and arrange the rolls, cut side up, in a single layer. 11. Prepare the grill for indirect cooking over medium heat (as close to 375°F as possible). 12. Place the skillet with the rolls covered with foil over indirect medium heat, close the lid, and cook for 25 minutes. Wearing insulated barbecue gloves, rotate the skillet 180 degrees, close the lid, and cook for 10 minutes. Remove the foil from the skillet and continue cooking until the dough is cooked through and the tops are lightly browned, 20 to 30 minutes more. 13. Remove from the grill, set on a heatproof surface, and let cool for 10 minutes. 14. Meanwhile, make the icing. In a large bowl stir the cream cheese and milk. Sift the confectioners’ sugar into the bowl, and then stir to combine. Add the vanilla and salt and whisk until smooth. 15. 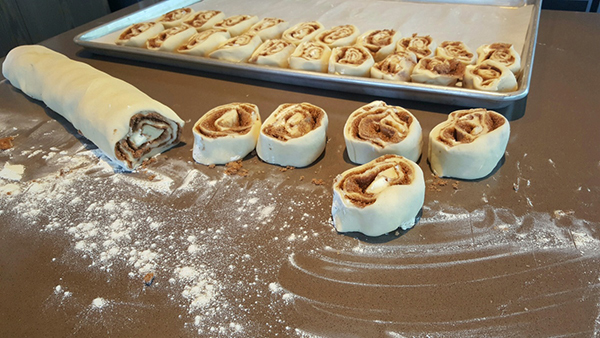 Spread the icing over the top of the rolls and let stand for 10 minutes. Using a thin-edged knife, cut between the seams of the rolls and transfer to a platter or cooling rack.